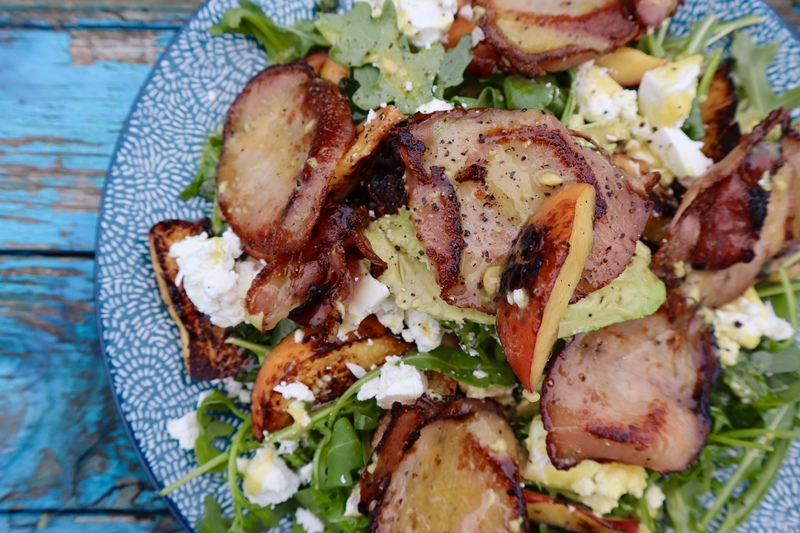 It’s summertime here in Australia which means lots of gorgeous fresh salads and simple fuss-free recipes that can be made in next to no time – giving you more time to laze in the summer sunshine or at the beach. The combination of ingredients in this salad is the perfect mix of creamy, salty, sweet and bitter and it is hearty enough to serve as a main meal – just add crusty bread and crisp white wine. To watch us make this recipe click here. To make, brush a hot grill or pan with olive oil and add peaches. Season with salt and pepper and cook peaches until they are golden on one side. Flip over, being careful to check regularly as they will cook fast. When both sides are golden remove from heat. On the same grill add pancetta slices and cook on each side until sizzling and golden. Remove from heat. To make dressing, combine all ingredients in a small bowl and stir until mixed through. Set aside. To assemble salad, add rocket and shredded fresh mint leaves to a large plate. Top with peach halves and crumbled feta. Place pancetta on top and avocado slices. Drizzle with lemon dressing and add a good crack of black pepper. Serve and enjoy! You can watch us make this delicious salad recipe here. Want more salad ideas? Click here for our Seared Sesame Tuna, Edamame and Avocado Salad and here for a delicious Zesty Calamari and Citrus Salad. Yum! This looks and sounds delightful!